.Traci Skene-- Comedian, Writer, Author: The Tonight Show With ? The Tonight Show With ? It's been a bad week for funny white guys. Jay Leno, Conan O'Brien, Jimmy Fallon and Carson Daly have been forced into a multi-million dollar game of musical chairs while Jeff Zucker in a dunce cap lifts the phonograph needle off a 1975 Judy Collins' recording of "Send In The Clowns." Zucker-- who must feel like a tiny gerbil in a giant wheel-- formulated an evil genius plan to compensate for his historically royal screw-up by proposing moving Leno to 11:30, O'Brien to 12:05 and Fallon to 1:05. When asked about the future of Carson Daly, Zucker replied with some surprise, "Is he still alive?" Carson Daly-- who is about as exciting as a slug in a sensory deprivation tank-- has the hyper-ignominy of not even being mentioned in the debacle. I suppose he can always return to his previous job as one of the animatronic Presidents at Disneyworld. Yesterday, O'Brien announced that NBC will have to pry the 11:30 time slot out of his cold, dead hands... or something like that. 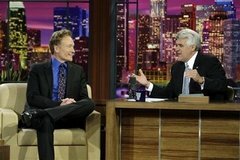 Leno and Fallon have been strangely silent. Fallon, no doubt, is at Kinko's printing out updated resumes. David Letterman, in the meantime, has taken a break from his Sarah Palin bashing to revel in the late night unrest. He hasn't had this much fun since the last group of female interns arrived at Rockefeller Center. So, in an effort to make everybody at NBC happy, Sucker-- I mean, Zucker-- has only succeeded in making everybody at CBS happy. But, just like when Hugh Hefner had to cut back from eight blond girlfriends to a more manageable three, one of the four hosts will have to go. The question remains, which one will be the odd man out. Which white guy will have to finally hang up his "Bush is dumb"/"Cheney is evil" jokes, even though they should have been abandoned 13 months ago? My guess, Conan will be the first one to call U-Haul. Perhaps the ultra-liberal Zucker should use this TV calamity to look inward. As a registered Democrat, if he is indeed all about diversity, then why are there four incredibly pale dudes battling it out for spots on his network. I don't believe in comedy affirmative action, but with all the funny women and minorities crawling all over this country it would have been fairly easy to find a suitable late night host among the group. At the very least, a conservative white guy-- Dennis Miller maybe-- would add another point of view. The peacock, however, would rather act more like an ostrich and bury its head in the sand. If there is any justice in this crazy world we call television, Jeff Zucker will be declared The Biggest Loser. Worst case suicidal scenario? Carson Daly is inked as Tonight Show host. He'd get higher ratings sawing himself in half. As the saying goes, "Whatever happens, I have a feeling this is not going to turn out well!"